The Time to Make Progress? Right Now. The theme for this year’s International Women’s Day is "Press for Progress" -- a call to action for the global community to come together to demand gender equity. While women deserve fair treatment in health care throughout their lives, there is no other milestone as poignantly deserving as the moment when a woman becomes a mother. It is a time when she and her baby are most vulnerable and their health outcomes are inextricably linked to each other. Through Saving Lives at Birth (SL@B), USAID and its partners -- theGovernment of Norway, the Bill & Melinda Gates Foundation, Grand Challenges Canada, the U.K’s Department for International Development and the Korea International Cooperation Agency -- support 116 unique innovations spanning new or improved technologies, scientific advancements, improved service delivery models and innovative approaches to empower and create demand for health services. Each addresses a critical challenge during the continuum of care for both mom and baby. Here’s why our work is so important. Over the last two decades, we have seen a 37 percent reduction in maternal mortality and 40 percent reduction of under 5-mortality globally. Still, those efforts aren’t enough. Progress to reduce newborn deaths has been significantly slower. Today, an estimated 2.6 million stillbirths, 2.7 million neonatal deaths and 303,000 maternal deaths occur globally each year, signaling a major gap in interventions specifically around the time of delivery. This gap is particularly acute in poor, underserved communities and among women who are disadvantaged. So how do we address this gap? We have some innovative ideas that have leapfrogged conventional approaches, and are showing success. With Massachusetts General Hospital (MGH), we are helping tackle the most common cause of maternal morbidity and mortality in developing countries, postpartum hemorrhage (bleeding after birth). With SL@B support, MGH is scaling its next generation uterine balloon tamponade (UBT) system and training curriculum for health care workers who treat uncontrolled postpartum hemorrhage. They have introduced the device in over 550 facilities across Kenya and Sierra Leone and saved over 600 lives, while encouraging interest and use of the UBT in 22 countries. We are helping the Liberian government engage private health care providers, drive improvements in quality maternal care and empower women by giving them greater choice in where to seek care. In partnership with D-Tree International and Results for Development, SL@B is supporting Washington, D.C.-based Open Development to streamline and automate patient, provider and payer transactions in Liberia through a mobile application. We are equipping mothers with tools and resources that empower them to seek care for their newborns, like the BEMPU Hypothermia Alert Device. 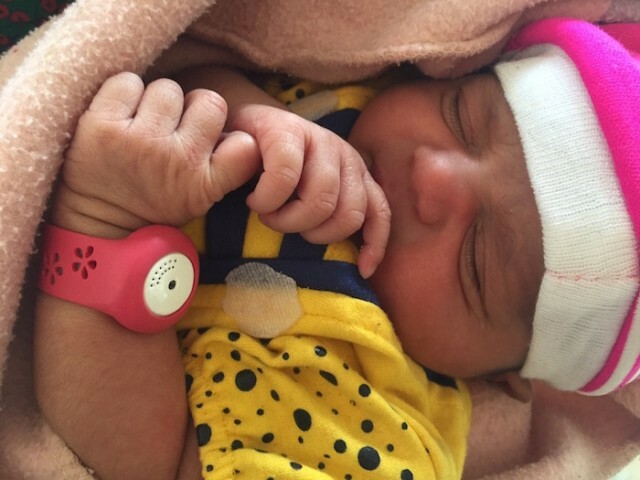 It is a newborn temperature-monitoring wristband that a baby wears and can alert mothers or other caregivers if their newborn’s temperature falls too low. Moms can immediately spring into action with Kangaroo Care, also known as skin-to-skin care and usually between mom and baby. It is a simple, yet effective way of regulating a baby’s heart rate and body temperature to prevent the onset of hypothermia-related complications or death, particularly for low-birth weight and premature babies. This innovation, named one of Time’s Top 25 Inventions of 2017, has not only improved health outcomes for an estimated 10,000 babies, but it is enabling women and their families to practice healthy behaviors in caring for their newborns. SL@B is grounded in the belief that significant breakthroughs in innovation often come about when new ideas and disciplines are applied to long-entrenched problems. The projects described above are just three examples of how innovations can help us accelerate progress in reducing maternal and newborn mortality and achieving gender equity in health outcomes globally. Our innovators are a testament to the fact that good ideas can come from anywhere and with strategic partners, support, and determination to save lives, they can create real impact. Let today serve as a reminder that together, we have the opportunity to close the intervention gaps for pregnant women and their babies and turn insurmountable development challenges into solvable problems. Their futures -- and our world -- depend on it. About the Author: Sofia Stafford serves as a Program Assistant in USAID’s Center for Accelerating Innovation and Impact and helps manage the Saving Lives at Birth Grand Challenge.